United Cutlery Stingray Dive Knife with Rubber Leg Straps & Sheath | BUDK.com - Knives & Swords At The Lowest Prices! If you are searching for the best dive knife available, then look no further than this Sting Ray dive knife from United Cutlery. Constructed of one piece of solid AUS-6 stainless steel, the half-serrated blade offers a slotted handle for a secure grip with a lightweight feel. It's a real handy application having a knife strapped to your leg for easy concealment. Very comfortable and easy to forget it's there only problem is it comes very dull. I just got My knife, and am very pleased with it. It wasn't too sharp out of the box, but easily sharpens, the sheath is very comfortable, and is of a good quality. Overall, I am very pleased with it. 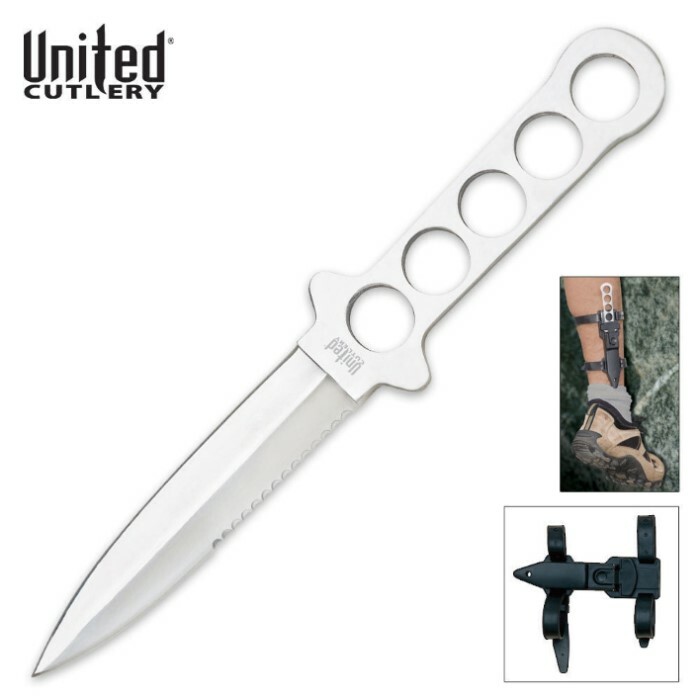 This is a great diving knife at a very low price. It is very easy to put an edge on and it is a good size. The sheath is comfortable, although it does take considerable effort to withdraw the knife. Other than that, amazing bargain! Ok, this is an amazing knife, one of my best purchases. Yeah, it needed sharpening, but I prefer to put the edge on my knives anyway. Any complaints about the sheath are likely a result of doing it wrong. Very comfortable, I could wear it all day. I ordered this knife on august 2, got it the 6th. Its a good all around knife, sheath and straps. Only down fall is its not sharp out the box, but holds an edge after a carbon sharpener. Wow! This thing is cool. This is one of my favorites so far. This is a diving knife and I have no doubt this will be great for it, but it is also great for anything else. Solid full tang construction with serrated blade that comes sharp. Excellent size and feels GREAT in the hand. I haven't attached the sheath to my leg yet, but after looking at it thoroughly, the sheath looks like great quality too. The straps are thick rubber and are durable. The actual sheath is hard plastic and the knife is tightly held inside and in order to take the knife out, you have push a button and the knife comes out easily. I REALLY like this knife. It's a GREAT buy!! This is a pretty solid knife, but it doesn't really fit well into the sheath - it's really hard to get it out because it's too thick. I think the Ridge Runner one is a little better.